I just finished my first year in Turkey! The children have had their last day. In between teaching and vacationing there is an ambiguous period of time that administrators all around the world call "Teacher Workdays." In my current school, these days span out for about a two week stretch. Now listen, I've got as many loose ends to tie up as the next teacher. The thing is, I'm one of those people who likes to hurry up and get everything done at the close of school as fast as possible. I'm not really interested in dilly dallying. So after completing all of my tasks a full week earlier than the time I was allotted, I found myself with an exorbitant number of hours for thinkin'. I tend to write down thoughts on little bits of paper and shove them into my purse as I cruise through life. Usually these small scraps (gum wrappers, ticket stubs, post its) get lost at the bottom of my gargantuan bag and if they resurface it is usually MUCH later and by that point the paper will be so dirty and torn up that the messages are nearly impossible to decipher. 1) Somebody in my office is trying to poison me. I know that this sounds extreme, but it's real. The water in the cooler tastes like poison. I guess, if I were to be completely accurate, I would say that someone is trying to poison the entire English staff. I am extremely familiar with this kind of poisoning because I've been dealing with it for a lifetime. Between the rotten food in my childhood refrigerator and the sleeping pills my sister would try to drug me with, I'm a goddamn professional. A professional victim of poisoning. I should add that to my friendship resume. #1 Why do Turkish people always sit so close? There is an entire amphitheater to spread out and someone is literally sitting on my feet. This person is a stranger. And they are touching me VERY unnecessarily. #2 What's up with the fanatical clapping? Let me clarify something: I am all about clapping for performers. But there is no one performing right now and people are just randomly clapping in large groups. It's like group-clapping-turrets. Is someone performing a social experiment to see how many people they can get to clap?? I think it's a cultural thing. The other day when I came into class with my hair straightened, my students gave me a round of applause. My girls told me that I look like Katy Perry. They also told me that looking like Katy Perry is a very good thing. 3) Did you know that Katy Perry fans are called Katy Cats? True story. Anyhow, my friend Gina gave me some clothes and check this out: Since I have started wearing her things, random strangers have been approaching me on the street and calling me Gina. But here is the weird thing: The clothes that she gave me were not in her regular rotation -- they weren't "signature Gina clothes" or something like that. Additionally, we look nothing alike aside from the fact that we are both white women. So how are these strangers making this connection?!? The entire experience has been spooky, perhaps even borderline alarming. 5) Here is a picture of her with a picture of her. There is also another small picture of her that I glued into the corner of the picture of her. Gina and I look nothing alike. But the drawing is really good. This is me. You probably think I'm at the beach. But I'm actually inside my hotel room posing in front of a photograph of the beach. I counted 14 of these photos (the exact same one mind you) around the hotel and I figured they were there as a backdrop for selfies in case someone who was visiting the beach didn't actually want to go outside. What would you say if I told you that I had "borrowed" portions of Rocky Horror Picture Show for my 5th grade student production of Grace and the Time Machine this year? Because I did. And it was very warmly received, thank you very much. I included music and coordinated dance moves. Rocky Horror is totally appropriate for ESL students in Turkey because they don't really know what is going on. but the nuances went unnoticed. So many details are completely ignored here in my beloved Turkey, day in and day out. Sometimes people will say ridiculous things to me in such an aloof manner, that I don't even register the extent of the absurdity until reflection on the matter much, much later. "Oh, nobody told you about how the main streets occasionally flood with sewage? It happens a couple times a year. I mostly can't leave my apartment when it gets all sewage-y like that." When my friend told me this, I just nodded in agreement. It probably was a bad idea to walk around in a sewage flood. But later I thought to myself, "Regular sewage floods...seems like something I should know about. I'm sure glad someone gave me a heads-up for that potential happening." Other times I find that Turkish people are detail oriented to the EXTREME. For instance, if you walked into the apartments of many of my expat friends, you would see photographs of uteri on their refrigerators. Why? Because Turkish gynecologists love to photograph the uterus -- whether it is laden with child or not. It's like a little bonus gift at the end of your gynecological exam. Why should pregnant ladies be the only ones who get photographs of their uteri? Equal opportunities for non-pregnant women! Also, doctors text all medical test results directly to your cellphone here in Turkey. Is that weird? I feel like that's weird. In unrelated news, I've been really psychic lately. But not psychic in the traditional sense. What I mean is, I've been channeling Frida Kahlo. She has been in my mind (and heart) for several hours each day for the last few weeks. THEN, out of NOWHERE, my sister sent me a Frida print scarf. Coincidence? I don't believe in those. 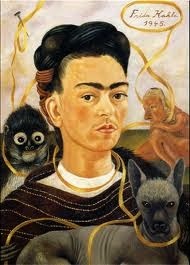 I think that Frida is trying to tell me to start a series of portraits that feature wild animals. And I don't plan to let her down. More to come on the self-portrait front soon. This is what I have been thinking about. All the time. My mind has been a kaleidoscope of Frida Kahlo portraits. One last thing. I recently saw this guy. I was the only person that seemed concerned that he was there. Then I got to thinking, "Hey, maybe I am ACTUALLY looking at the legit Grim Reaper right now and no one else can see him." Pregnant pause in my mind. "Perhaps I will die soon," I quietly murmured aloud in a slightly tragic tone. But he never approached me with an offer for my soul, so I feel like I am in the clear for now.